I've got a pair of Carolina ducks (American Wood Ducks) and a few weeks ago I found the male dead in the pond. I've no idea what happened. He showed no signs of being sick and he wasn't old, younger than his female. As usual, he's the more colourful of the pair, with the female being beige and brown. 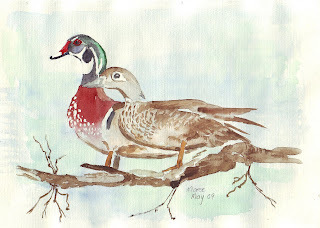 I did this painting of them in May this year, but the tree branch was added for interest. Doing a quick sketch of them was fairly easy, as they stood in one place for quite some time, keeping an eye on me sitting on the garden bench close-by. Getting the colour was another matter, because once they moved off, it was constant motion and I would only get glimpses of colours as they swam to and fro on the pond, wondering when I'm going to be leaving them in peace again. This was the last pair I had left over from my breeding stock before selling all the ducks when we moved from our previous smallholding to where we are now in 2003. I bred with these ducks for a number of years, always had about 10 pairs, each pair raising approximately 10 ducklings at any given time, or should I say, I would be raising about 50 ducklings at a time - they are very delicate and fragile when small, and have to be removed from the parents within the first day otherwise more than half usually don't survive due to various factors like getting cold, wet or picking up some disease. I housed about 5 to a box, with a light to keep them warm and water in water-drinkers impossible to throw over, sometimes having 5 or 6 boxes to tend to. They would be pinioned within two days of hatching, otherwise you would have ducks (and then not indigenous at that), flying all over the neighbourhood. Then, when they were about 12 weeks old, they would be released to the pond area, waiting to be identified as male or female at about 5-6 months old, when I could sell them as pairs. Each one had to be tagged with birth date and from which parents, so that one doesn't pair a female with a brother, but made sure she was betrothed to a neighbour to keep the strain pure. In America these ducks nest high up in the trees, and then the babies plummet from the nest onto the soft leaf litter below, amazingly surviving such a long fall. When they nest at the top of tall buildings, the journey down is far more hazardous. very sad the male died. lovely painting. A beautiful memory of a sad event. What an interesting post. Thank you Teri, and they are gorgeous ducks with lovely characters.